I wonder if its mine. 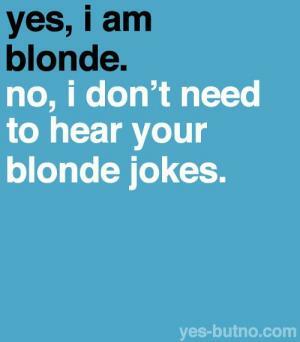 No, I don't need to hear your blonde jokes. Two blonde women are talking..
- did you do it for money or for love? A blonde spies a letter lying on her doormat. It says on the envelope "DO NOT BEND ". She spends the next 2 hours trying to figure out how to pick it up. A blonde goes to the vet with her goldfish. "I think it's got epilepsy," she tells the vet. The vet takes a look and says, "It seems calm enough to me". The blonde says, "Wait, I haven't taken it out of the bowl yet". Two blondes find three grenades, and they decide to take them to a police station. A blonde is in the bathroom and her husband shouts: "Did you find the shampoo?" She answers, "Yes, but I'm not sure what to do... it's for dry hair, and I've just wet mine." 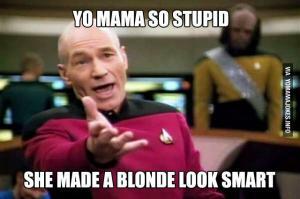 The blonde looked at the other blonde who was wearing a name tag and she said "'Debbie'...that's cute. What did you name the other one"? 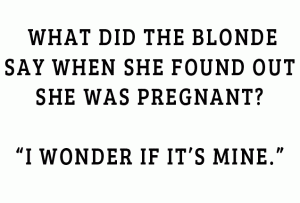 Q: What did the blonde say when she found out she was pregnant? A: I wonder if it is mine. A blonde decided to paint a room. When her husband got home, he asked, "Why are you wearing an Alaskan and a winter coat?" She replied, "The can said for best results apply 2 coats." Why did the blonde take a ruler to bed? To see how long she slept.